Some children as early as 5 or 6 years of age may benefit from an orthodontic evaluation. Although treatment is unusual at this early age, some preventative and proactive treatments may be indicated. By age 7, most children have a mix of baby (primary) and adult (permanent) teeth, which makes it possible for an orthodontist to assess, identify, and begin to treat, if necessary, any dental abnormalities. Some common orthodontic problems seen in children can be traced to genetics. Children may experience dental crowding, too much space between teeth, protruding teeth, extra or missing teeth, and sometimes jaw growth problems. Other malocclusions (“bad bite”) are acquired; in other words, they develop over time. These malocclusions can be caused by thumb or finger sucking, mouth breathing, dental disease, abnormal swallowing, poor dental hygiene, the early or late loss of baby teeth, accidents or poor nutrition. Sometimes an inherited malocclusion is complicated by an acquired problem. Trauma, and other medical conditions such as birth defects, may contribute to orthodontic problems as well. Whatever the cause, a skilled orthodontist is typically able to treat these conditions successfully. Early detection of orthodontic issues is advantageous for patients, as many problems are easier to correct if they are found and treated early while the mouth is still developing. Some young patients may benefit from undergoing what is called “Two-Phase” orthodontic treatment. The benefits of this type of treatment are substantial, often reducing the need for extractions or surgery later in life, improving airways, and encouraging proper facial growth. The first phase treatment is performed during a period of mixed dentition, that is, when the child has both permanent and baby teeth. A significant amount of growth is occurring at this age, and it is possible to harness this natural growth with orthodontic treatment in order to guide the teeth and jaws into more ideal positions in the mouth. Phase I treatment will typically last 12-18 months. The next step in the process will be a period of rest, during which time we allow the remaining teeth to erupt, and monitor their progress at regular increments. Phase II occurs once all permanent teeth have erupted. 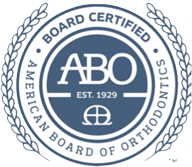 This phase typically consists of a full set of braces, which are applied and worn over a period of one to three years, depending on the patient. For those patients who have undergone Phase I treatment, their jaws are already in alignment and their teeth all have a place in the mouth, so this becomes a time in which we can focus on the aesthetics of a beautiful, permanent smile. After the braces are removed, most patients wear a retainer for some time to keep or “retain” the teeth in their new positions. The orthodontist will determine how long the retainer needs to be worn. Most patients remain under the orthodontist’s supervision during the retention phase to ensure that the teeth stay properly aligned. Retention is the final and possibly most important part of orthodontic treatment. The retainer holds the teeth in their final alignment; without proper use and compliance, teeth could slip back towards their old positions.